And welcome to this super sunny Sunday 7: *how* fabulous is this scorchio weather? In case you haven’t already guessed, this edit is all about buttons, my current obsession. BIG button downs… though not enormous, gigantic ones. You’ll see what I mean in a sec. Also, this is a simple *just* seven kind of Sunday 7, no stinker or wildcard this week… it’s an actual sunny bank holiday weekend, after all! I love this little vest top. But jeez! would you look at that neckline? And the deeper cut armholes? Not one for titchy moi, that’s for sure… though if you are able to wear that kinda low neckline, this vest is available in Pale Pink and Bright Yellow as well. This one, I was able to try in store as my local branch actually stock it. But again, being short… the straps of this vest did that thing where they slip off your shoulder because the arm hole is too big. Such a shame as it’s a really cute top. 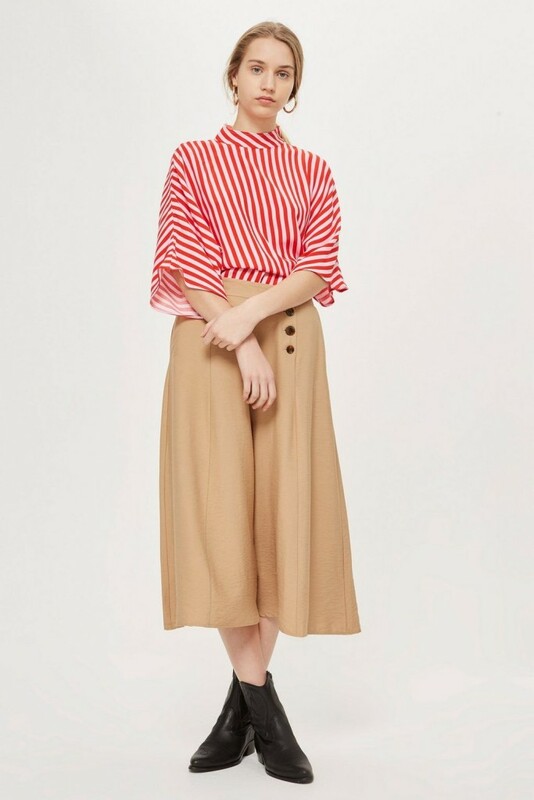 As you all know by now, I love a culotte, I love a wide leg trouser… these are both. A very wide legged culotte. Would you look at those cuffed half-sleeves? 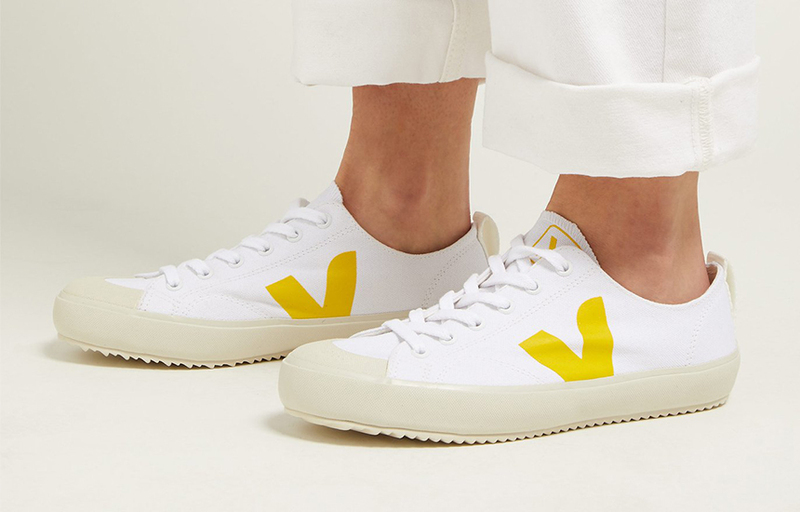 It doesn’t really matter – it’s such cute detailing. Adore this little linen top. BUT… for that oh-so-low-neckline again. After all… summer or not, most of us do wear bras still… right? There’s no way I can get away with that kind of a neckline. How beautiful is this one, from Warehouse? Anyway, since drafting this post, I noticed the gorgeous and super funny Emma Hill rocking the dress on Instagram yesterday… looking absolutely stunning in it and styled to perfection: I reckon it’s gonna be a sell-out. 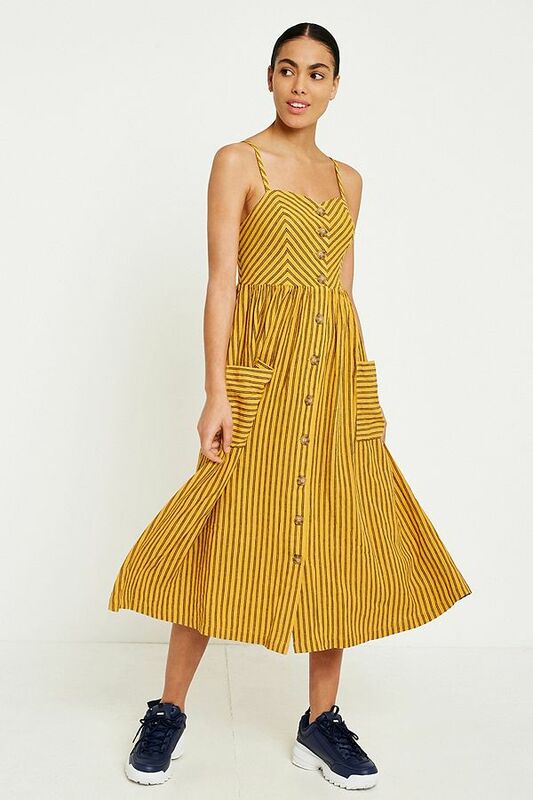 As for the length of it on us shorties… you could either wear it as a ‘midaxi’ length, or there’s a few inches to play with at the front there which, after taking up… wouldn’t make that bottom button appear to close to the bottom hem. This just has summer holiday written all over it. I love the orangey shade of red too. Though yes, as it’s full length, it’s likely that it will need taking up for most of us shorties. 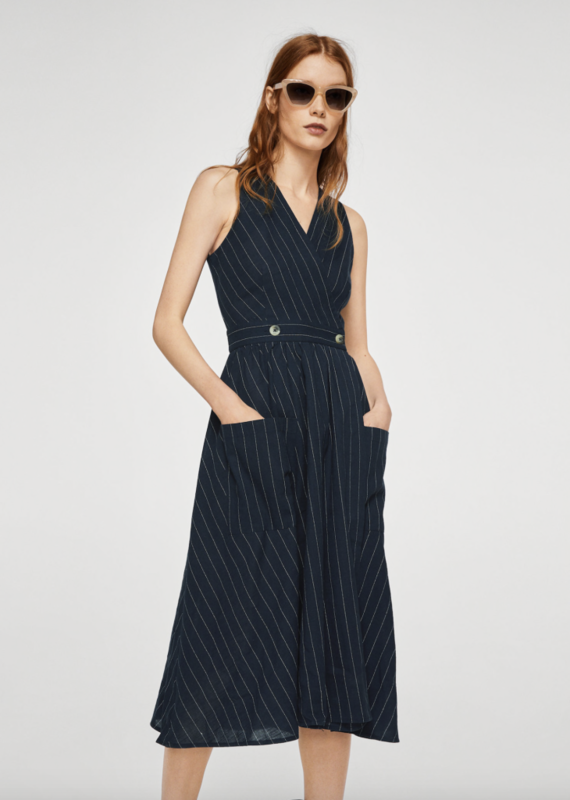 Although… I think the jumpsuit would look quite cute with a ‘rolled-up’ kind of chunky turn-up. I like that there’s quite a lot of yellow in the skirt. Though yes, I admit, I probably wouldn’t wear it because it’s just too loud for me. However… I do like it… my kind of muted colours (soft yellow, white, rust, dark green) with just a splash of bright red. *If* I were to wear this skirt though… I’d go for a plain white tee on my top half to help tone things down. And one last thing: those patch pockets! What’s not to love about those?! 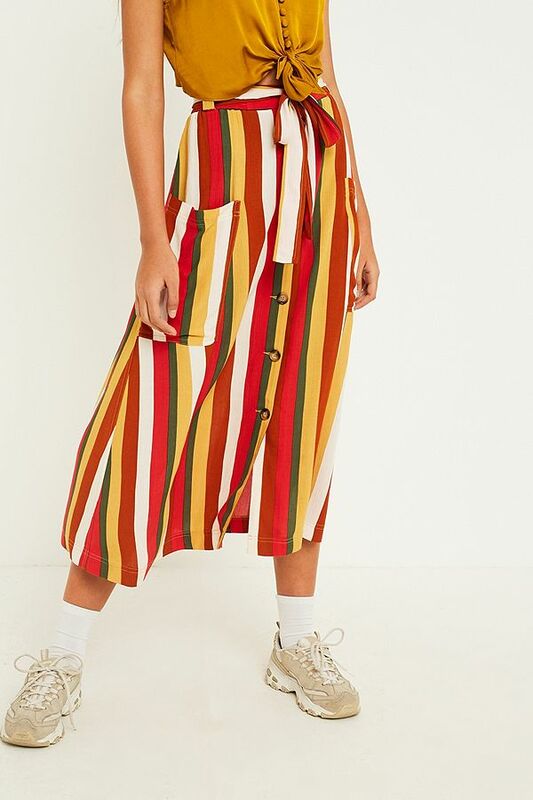 If this colourful stripe version is too much for you, the skirt is also available in a Dark Blue stripe on Pale Blue and Plain Red. Just search ‘Emila‘ on the UO site for the full range. 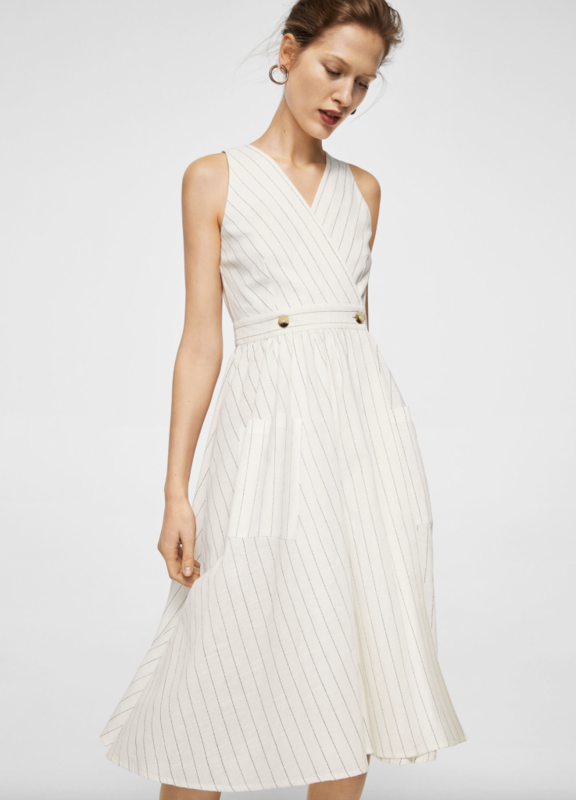 I know… another white-ish dress… more pin stripes… and yet more patch pockets. It’s clearly a bit of a thing for me right now. And whilst there’s not a mass of buttons on this dress… I’m drawn to those two buttons at the front there. Just a cute bit of detailing, right? As it’s knee length on the model, it’s going to be a true midi/ankle length on us shorties. But as I always say, that’s no bad thing! Right that’s it from me for this week. Feels rather short but hopefully, just as sweet as ever! Hope you’ve all had a wonderful Sunny Sunday… and there’s still another day of the weekend to go: yay! We got up normal school time today – ugh! But we set off at 9.30 and missed any traffic for a coastal day in Lymington (harbour walks & crabbing and pub lunching) as well as a stroll through the New Forest. Leaving early meant we got home early enough to have a BBQ and for they boys to ‘throw some hoops’ in their new basket ball ring. The hoop is a replacement for their old (rotten and somewhat dangerous) trampoline, which was dismantled and taken to the dump yesterday… those basket balls are noisy, eh? Oh well, payback for the grumpy neighbour whose 20-something daughter likes to party until 5am on a school night whilst her parents are away. Just wondering if 8am is too early to go out back and practice bouncing a basket ball: asking for a friend?! Thanks for reading & enjoy your Bank Holiday Monday! Ah thank you Kate! I think that was my favourite this week… but an all white dress and me? Would never work! I’d be interested to hear what you think of it though… the Navy one looks a bit see through so wondering if the white one is lined? It’s such a pretty dress! Hope it’s a good one on you! My absolute fave are the last two dresses! Just chic and stunning – though I’d need to lop off a foot of material I’m sure!! !